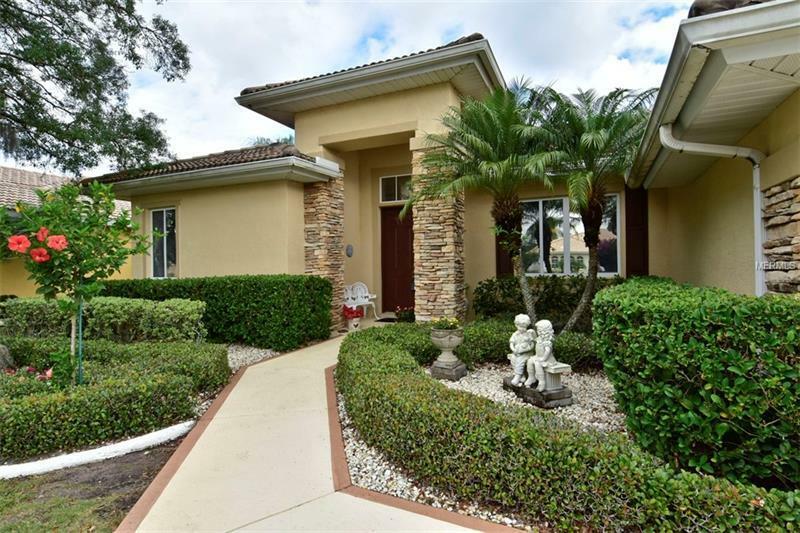 This home features outstanding views of a serene pond which attracts pleasing sights of Florida's wildlife! The decor is neutral and and there is plenty of natural light. The living room/dining room opens out to the lanai overlooking the pond as does both the kitchen and the master suite. Your chef's delight kitchen is open to a spacious family room which also provides a calming view of the pond. You will enjoy a large master suite, and the master bath presents a garden tub, large shower and linen closet. The home has a split floor plan so your guests will have their privacy, and your third bedroom/den or office will enjoy privacy as well. Add to all of this a two car garage with industrial strength shelving, an inside utility room, and an affordable HOA fee which takes care of your lawn, bushes and trees. Visit this home today and make it your own so you can enjoy the freedom of a carefree lifestyle in an active 55+ community.